Keyvan and Marlon are two childhood friends and co-founders of Pantera Bianca. With the aim of revolutionising the cashmere industry, they put the concept of ethical production at the heart of what they do. We reached out to them in the midst of their second successful campaign which, with still 9 days to go today (18 March 2019), has already exceeded the target by almost 900%. Q: You recall style icons. Who are the people that really inspire you? A: There have been many great people from which we can learn. Personally, we could list hundreds or maybe even more names that have inspired us. Since the focus of this interview is on Pantera Bianca, we would like to talk about those who have written history thanks to their style. First of all, comes Gianni Agnelli, he is the epitome of the great Italian businessman, a man who unified a strong charisma with a lot of charm. We look up to him with the nostalgia of the Italian Dolcevita. Steve McQueen is also a great inspiration for us, he was sporty and classy at the same time, simply Mr Cool. Steve McQueen made everything he wore look good – whether it was a polo shirt, a lounge suit or a tweed blazer. He epitomized style, he was known for sticking to clean lines, he maintained a masculine and rugged look with very linear apparel; the Dolcevita, for instance, is designed in his honour. We can’t talk about our style inspirations without mentioning perhaps the greatest of all, the Duke of Windsor. Pantera Bianca is about honouring these great people. If they were alive today, they would probably wear Pantera Bianca. Q: Cashmere for Italians means Cucinelli. Has he played any role in developing your business idea? A: Absolutely, we admire brands such as Loro Piana and Brunello Cuccinelli who are the global leaders in the cashmere industry. Cucinelli plays an especially important role as he has been the first in to bring an innovation to the conservative industry it was at the time: coloured cashmere, he had the courage to revolutionise the industry. However, for our crowdfunding campaign, it was more important to get inspired by other companies who were successful on Kickstarter, such as Filippo Loreti – the watch sellers who raised millions of dollars on pre-orders. Q: You claim that your business model has a positive impact on people working in the production pipeline. To what extent? A: All the people in our production chain are native Italians, who mastered the art of craftsmanship over the course of decades. We value their unique skills and because of us and other entrepreneurs that still embrace the “made in Italy” quality guarantee, they are able to keep their jobs with industry relative high and fair wages. As you might know, the Italian Fashion industry suffered massively with the development to outsource production to regions where both the materials and labour are cheaper. The silk industry in Como decimated, the leather industry in Florence suffered, as well as the cashmere industry in Biella, where many artisans who worked their whole lives handcrafting beautiful garments lost their jobs. Our concept to move back to the roots of fine Italian craftsmanship, to move away from mass production and focus on individuality and quality strengthens their livelihoods and their workplaces in Italy’s fashion industry. Q: Crowdfunding seems to play a pivotal role in your project. Why? A: We were personally affected by the lack of affordable, high-quality cashmere in the market. 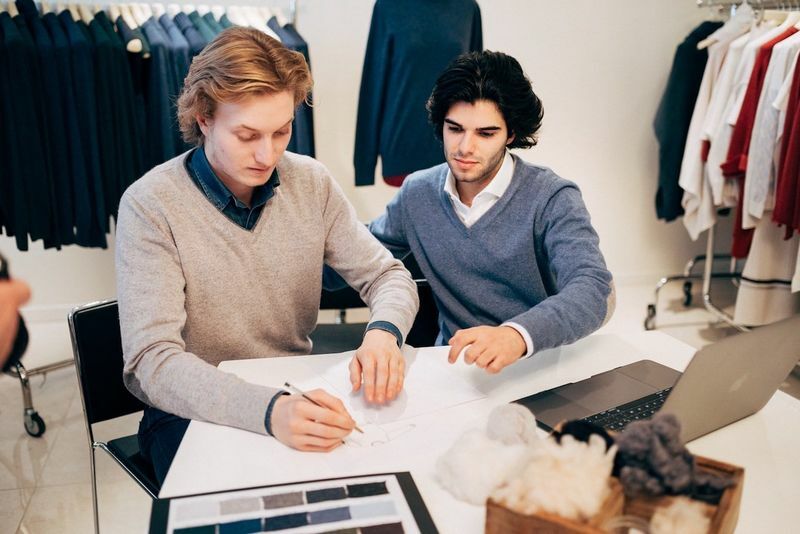 Surely, there is plenty of “cashmere” around, but finding truly qualitative pieces, with the best yarns and made by Italian artisans isn’t as easy. The problem we encountered is that you either find low quality, cheap sweaters made under terrible working conditions in Southern Asia, or, you find high-quality sweaters at ridiculously high prices. Luxury Brands usually charge more than 500% mark-up to cover costs regarding wholesale distribution, administration, labour and rent. We, on the other hand, avoid costs by cutting out the middlemen and by linking customers directly to the production facility. This is a very clear message and we thought it best suits the crowdfunding concept, so we decided to test the market with a crowdfunding campaign to see if others felt the same way we do. We ended up being successful. Q: What have you learnt so far from both your business experience and your crowdfunding campaign? A: We’ve learned that customers get ever more educated about the production processes of the things they buy. They seem to value ethical production standards and transparency and when showing and demonstrating the values and skills within our production they get to appreciate the same things too and are prepared to pay a little more for it than they would without knowing how the products we offer came about. We’ve also learned focusing on quality is a long-term objective that needs time to develop. It is impossible to become a major brand within a few years and maintain high levels of quality. It is a long-term process that needs to get nurtured with dedication and motivation. Regarding crowdfunding we’ve learned that there are many great Backers that are willing to support the process of creation and that share similar values to us. Generally, in crowdfunding you can create win-win situations where dedicated backers get a great product at great prices and dedicated project creators do not run the risk in making massive orders that won’t get sold. A: Our plans for the future are to maintain our focus on quality, and slowly expand our collection. We want to add several personalized accessories, we are in the process of developing our summer collection, where we will focus on premium cotton t-shirts and Polos that are made in Italy. We also want to engage more in influencer marketing and develop our online presence.